The Orphanmaster offers a glimpse into Christmas on Manhattan,1660s-style. Or, since the preponderance of colonists hail from the Netherlands, a glimpse into Sinterklass, the Dutch festival of St. Nicholas, which arrives on December 6th. Because we’re talking about The Orphanmaster, everything in this particular holiday season is not all sugar cookies. Sinterklass—Santa Claus or Saint Nicholas—came to New Amsterdam in early December, arriving with a ship that sailed all the way from Patria laden with toys and other gifts. Children laid out their shoes on the hearth the night of December 5th. The next morning, they would find them filled with nuts, sweets and, for a fortunate few, gold coins. 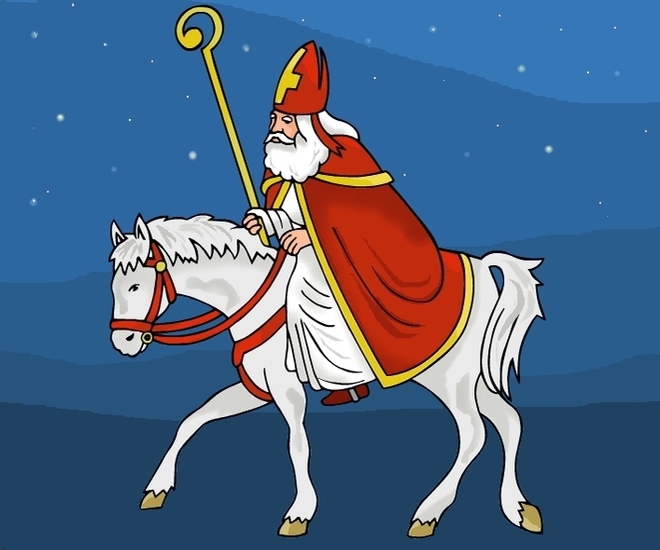 Sinterklass himself rode slowly down the Broad Way and along Pearl Street on a stolid white mare, fairly gleaming in his long, draping robe, pearly beard and tall red bishop’s hat and mitre, brandishing a golden crosier with a curled top. He had apples for everyone, hard candy, frosted nuts. But these treats were only a precursor to the grand feast celebrated the following day, December sixth, when wealthier colonists served roast goose and potatoes and kool slaw drenched in vinegar and melted butter. Sinterklass was the patron saint of children, doling out gifts to the well-behaved, though everyone got their fair share regardless of how naughty they had been. Each child knew the story of the three little orphans during a terrible famine, how a malicious butcher lured them into his house, slaughtered and carved them up, then placed their remains in a barrel to cure, planning to sell them off as ham. Saint Nicholas resurrected the three boys from the barrel by his prayers, bringing the orphans magically back alive through the power of faith. The spirit of the season ruled New Amsterdam between the Feast of Sinterklass on the sixth and Kerstydt, Christmas, on the twenty-fifth. Director general Peter Stuyvesant, who made clear his disgust with any drunken carousing during the holidays, yet made his Great House ablaze with candles and invited colonists in to dance in the entry hall. I’d forgotten that Christmas legend of the orphans! Yikes. I wonder how many kids hear that story today.